In 2003 Captain Martin Reed was elected Chairman of the SAMA82. In 2006 he gave a lecture on the South Atlantic Medal Association 82 at the International Colloquium: The Falklands-Malvinas Conflict Twenty-Five years on which took place at Willoughby Hall in Nottingham University. Captain Reed wrote a chapter of the book Hors de Combat: The Falklands-Malvinas Conflict in Retrospect. 4 He became a member of The Nottingham-Malvinas Group. In 2012 Reed was the Merchant´s Navy representative at the RBL Festival of Remembrance at the Royal Albert Hall. Captain Martin Reed RD* is the Life Vice President of SAMA 82. 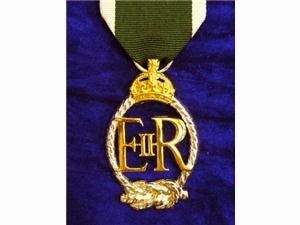 Note: Captain Martin Reed was awarded the Reserve Decoration(RD*) It is awarded initially after 15 years unblemished career in the Royal Naval reserve, with the bar being awarded after a further 10 years. The South Atlantic Medal Association (SAMA 82) is the the Charity caring for those awarded the official medal which was awarded to almost 30,000 British service men and women and civilians who took part in the 1982 conflict. Its Royal patron is The Prince of Wales and its National President is Lt General Sir James Dutton. Other Life Vice Presidents are co founders Surgeon Captain Rick Jolly (Commander of the Surgical team at Ajax Bay) and Denzil Connick(Corporal at the Anti-Tank Platoon of 3rd Battalion, the Parachute Regiment). 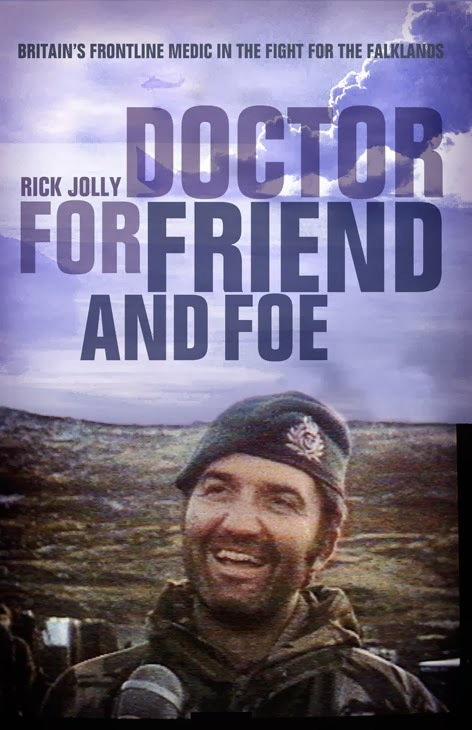 Captain Rick Jolly went to medical school at Bart’s in London and qualified in 1969. He became a Royal Navy doctor to 42 Commando Royal Marines. In 24 years of service he completed two tours with the Fleet Air Arm as a Flight Surgeon, Medical Officer recruitment / Officer training in the Dartmouth Training Ship HMS Bristol, and at the Britannia Royal Naval College. As Officer Commanding (OC) Medical Squadron of the Commando Logistic Regiment RM, Jolly was Senior Medical Officer of 3 Commando Bde RM in the Malvinas Campaign of 1982 and commanded the field hospital at Ajax Bay. Before the battle of Trafalgar Nelson wrote a prayer in his cabin, saying: ‘May humanity after victory be the predominant feature in the British Fleet.’ As a naval officer those words meant a lot to me so looking after the enemy’s wounded as though they were your own was instinctive. "People assume you’ve got to hate your enemy but that couldn’t be further from the truth. The only people who know what you’re going through are the people on the other side"
Dr Jolly, the hospital’s senior medical officer, insisted that all his men follow his example. And they were happy to do so, treating the wounded enemy with complete respect as the conflict raged across the Falklands in South Georgia, Goose Green and Port Stanley. Dr Jolly’s favourite patient was a terrified fighter pilot, rescued from the freezing waters of the South Atlantic. “His name was Ricardo Lucero,” says Dr Jolly. “He was coming in to attack one of our ships when he got a missile right up his tail pipe. 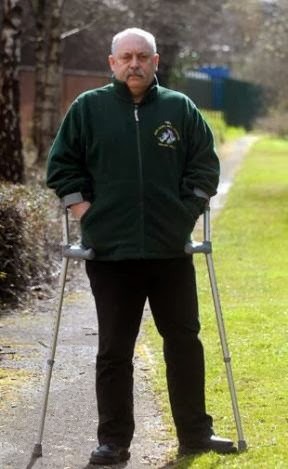 He ejected at the last minute, badly broke his knee and was fished out of the water”. 2 Para are based at Aldershot in Hampshire and form part of 16th Air Assault Brigade, along with the Pathfinder Platoon. 3 Para is located at Dover in Kent. During the 1982 Conflict 2 and 3 Para formed part of 3 Commando Brigade. 2 Paras captured the Darwin/Goose Green isthmus on 28/29th May.3 Paras made a night attack to seize Mount Longdon on 11/12 June. The 3 Paras lost 23 killed and 48 wounded in the battle for Mount Longdon plus 12 wounded before the assault and countless who suffered with their feet- 2 Paras assaulted later Wireless Ridge. (Burguess, J Captain RAMC. My experiences in the Falklands islands war (Operation Corporate)-JR Army Med Corps 153(S1)21-24. "We were on the last leg of a three-month world voyage, sailing from Naples to Southampton when we received a strange message: ‘Be prepared for a change of plan". April 2, 1982, and the MoD was already looking into ships capable of troop carrying. An advance party of military planners boarded Canberra on an unscheduled stop in Gibraltar on April 4, and by Monday had worked out where to put 2,500 troops. Mr Reed said: "By Friday evening the swimming pool was a flight deck, we were rigged for refuelling at sea, all troops equipment and stores were on board, and volunteer British crew from all over the UK had replaced our Indian and Pakistani crew". The liner sailed three days later for the South Atlantic, carrying paratroops, Royal Marine commandos and vast supplies for war. She later also landed the Welsh Guards and the 5th Infantry division, transferred from the QE2. On May 6, Canberra sailed south, escorted by the frigate HMS Ardent. On May 19 the crew transferred troops to the landing ships HMS Fearless and HMS Intrepid. The next day a Sea King helicopter crashed with numerous casualties, and Canberra’s new hospital came into its own as the dead and wounded arrived. Captain Reed said: “Our stadium area, which once hosted passenger entertainment, now had a triage, a resuscitation area and a four-table operating theatre area. 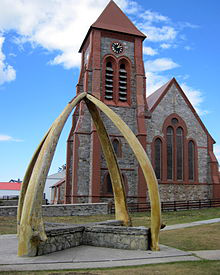 And our night club was now a 50-bed recovery ward.” May 21 brought the Battle of Falkland Sound and thrust Canberra right into the firing line. The vessel was ordered to move away from the islands, which left Mr Reed with mixed feelings. He said: "We sailed with much needed stores still on board, feeling as if we were running away." Captain Reed said: "We saw Ardent aground and burning in the distance but made for safety with some terribly wounded men aboard." HMS Ardent was a Royal Navy Type 21 frigate. Built by Yarrow Shipbuilders Ltd, Glasgow, Scotland. She was completed with Exocet launchers in 'B' position. 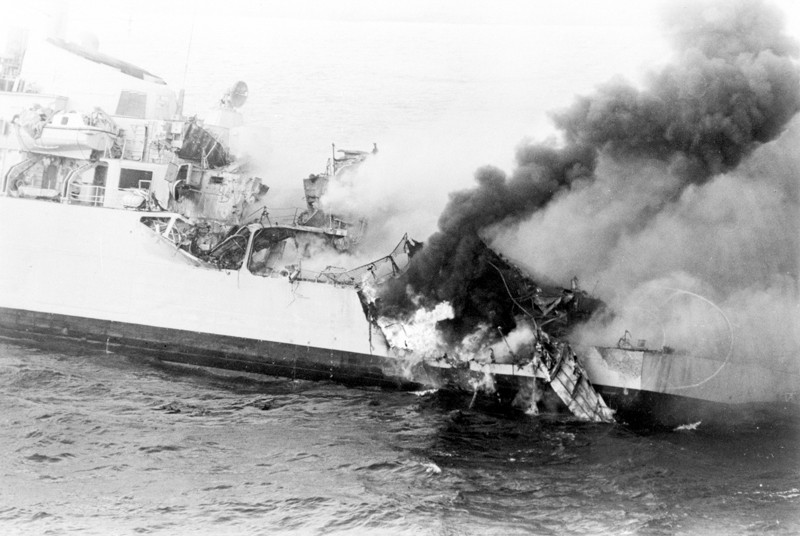 She was sunk by Argentine aircraft in the Falkland Sound on 22 May 1982. Three Argentine Navy A-4Q Skyhawks of 3rd Fighter and Attack Naval Sqd. hit Ardent with at least two bombs on the stern,a number of unexploded bombs which ripped into the hull, and several near-misses. This mission was carried out from a land base at Rio Grande. Navy aircraft used a dozen 500 lb (230 kg) retarding tail bombs during the attack. The following attack after the first wave of the Argentine Navy Aviation, was done by three A-4Q of the same force. Commanded by Lieutenants Benito Rótolo (3-A-306 on first pane), Carlos Lecour (3-A-305, second) and Roberto Sylvester (3-A-301, last) performs the second stage attack that definitely sinks HMS “Ardent”. One of the bombs launched by Lt. Lecour was the one that exploded inside a fuel storage initiating a fire that caused the sinking. Association). Buenos Aires, February 2014. 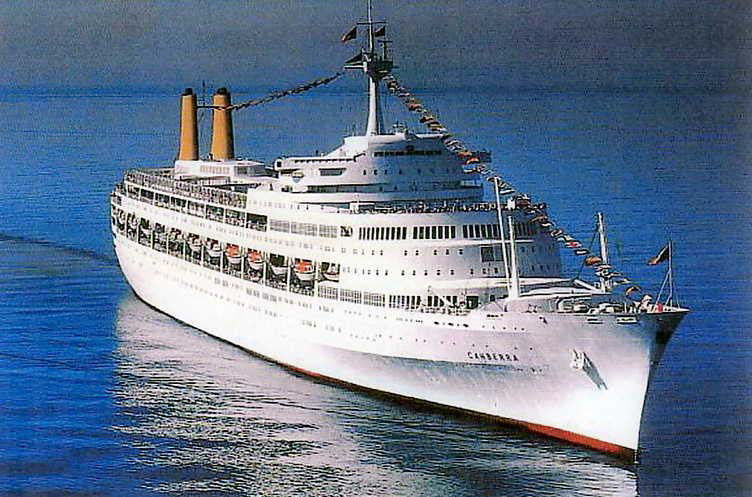 SS Canberra was an ocean liner, which later operated on cruises, in the P&O fleet from 1961 to 1997. She was built at the Harland and Wolff shipyard in Belfast, Northern Ireland at a cost of £17,000,000. 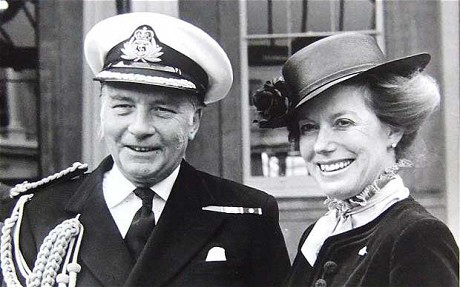 The ship was named on 17 March 1958, after the federal capital of Australia, Canberra. She was launched on 16 March 1960, sponsored by Dame Pattie Menzies, GBE, wife of the then Prime Minister of Australia, Robert Menzies. She entered service in May 1961, and made her maiden voyage starting in June. In the 1982 Conflict she served as a troop ship. The Canberra dealt with 172 casualties, including 90 Argentinians. Their original task having landed 3rd Commando Brigade, was to have remained in San Carlos as PCRS, Primary Casualty Receiving Ship, administering surgical and medical recovery and passing on casualties to the UGANDA. On June 18, 1982 , four days after the end of the conflict, the transport ship ARA Bahía Paraíso of the Argentne Navy left at the Luis Piedrabuena dock to 1,661 men and a day later the SS Canberra did the same with another batch of 4,100 Argentines. This last landing is remembered with great affection, as the soldiers were able to make contact with the population. The Norland docked, on the 21st , with 1,992 men, and then the ARA Almirante Irizar , bringing on board 956 troops of the Argentine Army. "It was the day we ran out of bread Madryn" recalled Julio Calvo president of that city´s veterans center .The soldiers arrived asking for a piece of bread , a staple which during the conflict not consumed. Conscripts who arrived on the continent were brought to the former barracks Lahusen, where the municipal bingo is now situated. They remained there a few hours after which they were transferred to their respective garrisons. "It was then that the neighbors of Madryn made contact with the soldiers, brought them bread and chocolate and opened their doors for them to contact their families by telephone ." The SS Canberra was withdrawn from service in September 1997 and sold to ship breakers for scrapping, leaving for Gadani shipbreaking yard, Pakistan the next month. She did not give up without a fight however; her deep draft meant that she could not be beached as far as most ships, and due to her solid construction the scrapping process took nearly a year instead of the estimated three months. Argentine Army Conscript Milton Rhys´ great-grandfather was William Casnodyn Rhys, a Baptist preacher ,an ultra-nastionalist from Port Talbot. Grandfather was born in the Rio Chubut valley (Patagonia),David Rhys a carpenter. Milton Rhys, a choirmaster is proud of his heritage. His Cwm Rhondda is flawless, his T-shirt a tribute to Wales’s rugby team. Yet, he has never been to Wales and, despite some effort, cannot speak Welsh. His is a split identity, half-Welsh, half-Argentine. (2) At the end of the 1982 Conflict shells landed around Government House, one killing two NCOs and injuring Rhys in the back. Rhys was taken as a POW to the SS Canberra where Captain Martin Reed was Chief Officer. The conscript helped as translator. Milton Rhys was seated with hundreds of others in a big room with a big piano, 300 or 400 soldiers. The British told them to organise themselves into those who needed the toilet, the bath and the doctor. Flying the flag, Milton Rhys left and Carlos Antonio Alcarraz both descendants of Welsh settlers in Patagonia. Photo:Paul Grover-The Telegraph-28 Mar 2012. Captain `DJ`Scott-Mason-The Telegraph 01 Dec 2010.